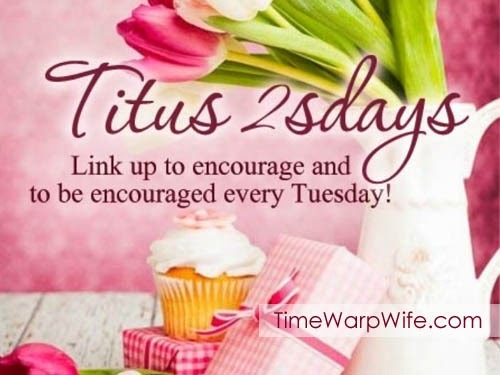 Titus 2sDay Link-Up Party & The Online Book Club! If you’re looking for a way to draw closer to God and bless your marriage in the process, join our online book club coming March 10th. 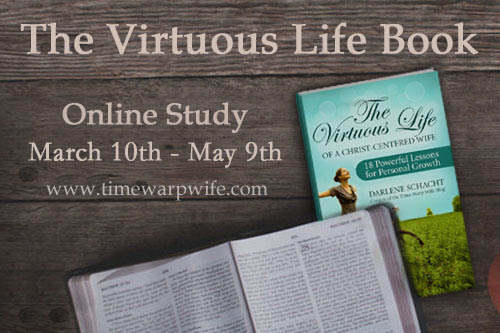 During the nine-week study we’ll look at seventeen virtues and how God is calling us to exercise them. Where: The study will be here on Mondays and Fridays starting March 10th, 2014, and will run until May 9th. I’ll also have a facebook group set up were we can further encourage one another. Subscribe to Time-Warp Wife so you don’t miss a post. What You’ll Need: A copy of the book, your Bible, a pen and a notebook. Although the book will be a great asset to the study, if you can’t afford a copy, don’t lose heart. You will still be able to glean a lot of encouragement week to week. In the Meantime: Check in the Friday before the study and I’ll have a link to the facebook group posted here. If you’re odering a paperback book from Amazon, make sure you allow enough time for delivery. Invite a Friend: Connect with a friend or a few friends. Invite them to study offline with you. Meet for coffee at your house, email each other, or chat on the phone… encourage each other along the way. This looks like it would be an awesome study! I would love to do something like this but am currently leading a women’s Sunday School class and I also have a young mom’s group that I do, so I just don’t think I have time to add in another Bible study or book. But I think that this might be a great book to do for my group when we’re doing with the other one we’re doing. Thanks for hosting today. Thank you, Darlene, for hosting today and for letting me know about the book club coming up. It looks great!! Thanks for hosting us again Darlene, I wish I could join the Bible study.. time difference. Looked for your link up last night and again this morning very early, but got called in to sub and now I’m so far down the list…thanks for hosting! I lead a small group at church and a few have expressed interest in reading this book. My question is do you think the single ladies in the group will get as much from this as those married. I know it will be good information for everyone, I just do not want to lose ladies because this is geared towards wives. Prov 31 was written as a lesson on what to look for in a wife, so that is my question I guess, is your book written in a way a single lady can relate to what she can be? Good question. Because it’s about working from the inside out, anyone can benefit from the study. There are a surprisingly high number of single women who enjoy my blog and I think it’s because it’s just basic encouragement for Christian living. If you would like to look inside the book you can do that through Amazon. There’s a feature in the sidebar where you can have a sample sent to your kindle, or you can browse a bit through the main page. The short prayers at the end of each chapter are geared toward marriage, but everything else can and should be applied to life in general. I’ll always put them up late the night before. Usually around midnight. And on the Facebook page I’ll post things throughout the week like quotes and images. 🙂 Because it’s on the blog, you can read it anytime you like.